A man opens up about his shortcomings as a father. Before his son was born, National Journal senior political columnist Fournier (co-author: Applebee's America: How Successful Political, Business, & Religious Leaders Connect with the New American Community, 2006, etc.) had a variety of expectations about what life would be like with him. They would certainly bond over sports, as the author had done with his father, and his son would be intelligent and socially well-adapted. Fournier’s hopes were no different than those of millions of other parents who want their children to achieve great things, but his son, Tyler, wasn’t interested in sports, he talked too loudly, and he had no sense of when he had stepped outside the boundaries of normal social conventions. It took more than a decade of this behavior before Fournier and his wife realized Tyler had Asperger’s. The author began to rethink everything he knew about being a father and tried to figure out new ways to bond with Tyler. Instead of forcing more sports on his son, Fournier opted to go on road trips to visit the homes of several former presidents, men he knew Tyler admired. 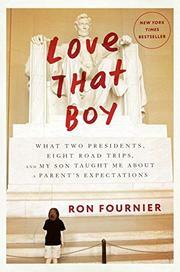 This is the personal story of Fournier’s transformation into a new father figure. It is also filled with research and interviews with parents and children on the expectations, hopes, and dreams they have for their children and the potential damage those pressures can cause. The desire to please the parent is so heavy that many children are “experiencing depression, anxiety, psychosomatic disorders and substance abuse…privileged kids also are more likely to develop stress, exhaustion…an unhealthy reliance on others for support, and a poor sense of self.” In a straightforward manner, Fournier outlines each of these issues and provides clues on how parents can tone down their hopes so their children can have happier childhoods and more fulfilling adulthoods. Good advice backed by research coupled with personal reflections by a father on how to let children grow up to be individuals rather than miniature versions of their parents.